When you export a Flash movie, you can decide how much color information to include in each exported bitmap. This is called compression. The more compression you apply, the less color information is included and the lower the size and quality of the image. Lossy compression reduces the file size by removing color information, while lossless compression reduces the file size (not as much) without removing information. You can choose to set a global compression for all bitmap files used in a Flash movie or you can set a separate compression for each image. As with all image compression, file size needs to be weighed against image quality. It is always best to experiment until you get the results you want. 1. Open the Library panel. 2. Select the bitmap from the Library item list in which you want to set compression. 3. Click the Properties icon in the bottom of the panel or double-click the bitmap file in the list. 4. Select the Allow Smoothing check box to anti-alias the edges of the image, making it appear smoother. Lossless (PNG/GIF). 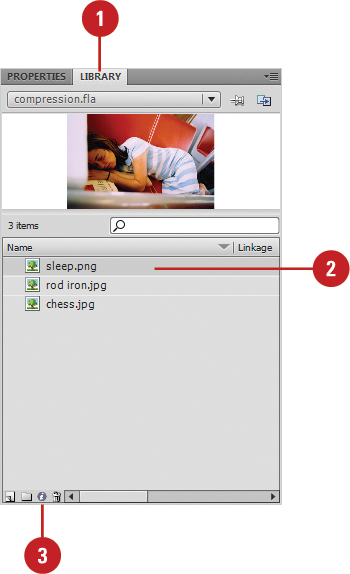 Compresses the image without losing any information; remains in its highest quality. Photo (JPEG). You can choose to use the compression information contained by selecting the Use Document Default Quality check box. By deselecting this feature you can set the level of JPEG compression applied to the bitmap. The values are 1-100. The higher the number, the less compression applied, producing a higher quality image.